The team behind THE RUNAWAY DINNER reverses direction in this clever pastiche of fairy tales in which everyone lives happily ever . . . before. "Jack was running like mad in the dark woods with a hen under his arm. Previously, he had stolen the hen and climbed down a beanstalk." But do you know what was Jack doing before he climbed down the beanstalk? Or what Jack and Jill were arguing about before they went up the hill? And what happened before that? 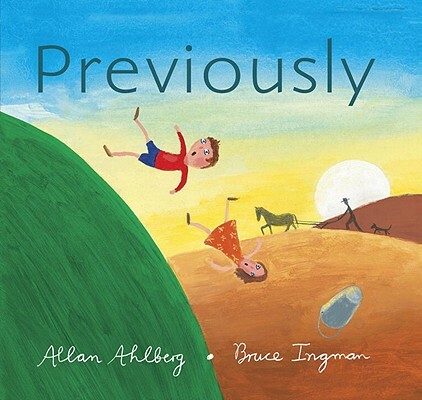 Every story, every person, and every thing started somewhere, and now the inventive and whimsical Allan Ahlberg explores what all your favorite storybook characters were up to previously, aided by Bruce Ingman’s energetic illustrations. Allan Ahlberg is the author of THE RUNAWAY DINNER, illustrated by Bruce Ingman; HALF A PIG, illustrated by his daughter, Jessica Ahlberg; the Gaskitts books, illustrated by Katharine McEwen; and many other titles, including the popular Jolly Postman series. He lives in Bath, England. Bruce Ingman is an award-winning children’s book illustrator who illustrated THE RUNAWAY DINNER by Allan Ahlberg and BOING! by Sean Taylor. He lives in London. A witty, stylish riff on favorite fairy tales. Children will delight in this energetic, amusing, and very approachable tale.